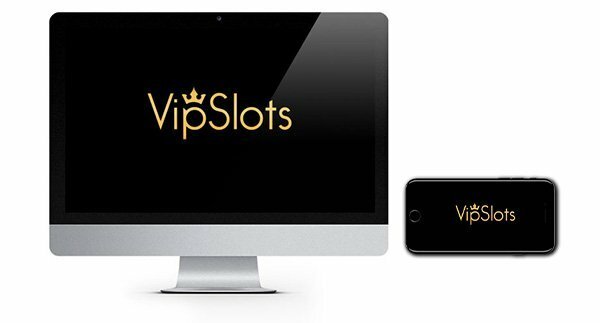 VipSlots is a multi-software casino featuring video slots, jackpots, video poker, table and card games. They look smart, the graphics aren’t mind-blowing but overall it has a nice feel to it, and it’s straightforward to use so not too many complaints from us. The casino is instant play as well as being compatible with mobiles. We always look to see if a casino’s games are mobile compatible and for the most part the VipsSlots collection is. You won’t need to download any software or apps, you can just log in and begin playing almost instantly. The casino has created a friendly and welcoming vibe and rewards players with regular promotions and offers including 10% cash back on your losses. Not a bad start, plus they have daily customer support available via live chat, email and toll-free telephone!. Deposits can be made using Bitcoin as well as several other regular payment methods including credit and debit cards, e-wallets and prepaid cards. Not the most exhaustive list of options but most players should find one that fits their needs. Ok, so let’s get right down to it and delve into the games collection at VipSlots! What they do have is a good choice of games from a mix of developers. Nothing hugely new there but their lineup is slightly more unique than we are used to as they have a lot of smaller developers on board so you can find games you won’t see everywhere which is great! Amonsgt their line up of developers, you can discover titles from Arrows Edge (including Live Dealer Games), Betsoft and Inbet Games. Their collection isn’t as vast as some multi-software casinos, but it’s quite refreshing to find one that is pretty focused as it gives you the opportunity to try more games. Plus they have done a great job of ensuring it is easy for their players to search through the games with a bunch of filter options. Play for fun or for real and choose from a brilliant choice of video slots and fun jackpot games. We like Stampede, Sugar Pop 2, Alkemor’s Tower, Rook’s Revenge and Ibiza! There are stacks of video poker titles, so if you are a fan, you’ll love the choice available here. Check out All American, Split Way Royal, Pyramid Double Bonus Poker, Multi-hand Jacks or Better and Deuces Wild. You will discover a good mix of table games such as blackjack and roulette but what you won’t find is any live dealer games at VipSlots. 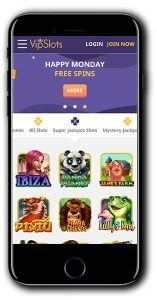 New Player Bonus – 30 No Deposit Free Spins + $1400 Bonus! It’s always a good idea to give a casino a little spin before you sign up. A great way to get a feel for a casino is with a no deposit bonus. This one from VipSlots is just the ticket too! 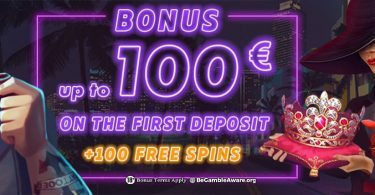 Sign up using the bonus code ‘WELCOME30’ to collect 30 NO DEPOSIT Free SPINS on the ‘Ibiza’ slot game. IMPORTANT NOTICE – Make sure you are aware of gambling regulations in your country of residence before you register at VipSlots Casino. An ok casino, good choice of games, but no live casino lets them down a little. 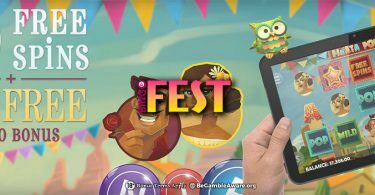 BingoFest Casino: 10 No Deposit Spins + $25 Bino Bonus!